Want to make your marketing materials really stand out? Consider this laser pen flash drive, which provides multifunction to maximize your brand’s exposure. Not only can users store and access data using these unique USB drives, but they can also use them in presentations as pointers, or use them in other ways, with your logo prominently displayed on each product. It’s a great way to keep users aware of your brand. You can fully customize these Laser Pen flash drives with your logo, and choose from silver, white, or black colors. You can also customize data capacity, depending on how much data you would like to store or allow users to store. Along with other original flash drive designs we offer, these products are a unique way to combine personal use with visual appeal in your marketing materials. To purchase a bulk shipment of Laser Pen USB drives, simply request an instant free quote from us today, and we’ll work with you to create a unique product. We allow you to customize nearly every aspect of these flash drives to help effectively promote the brand and match its overall theme. Regardless of which flash drive models you choose at Every USB, you’ll get top-quality products with every order. We also enable customers to professionally set up artwork using our Adobe Illustrator templates, which can help us understand exactly how you want the final product to look. 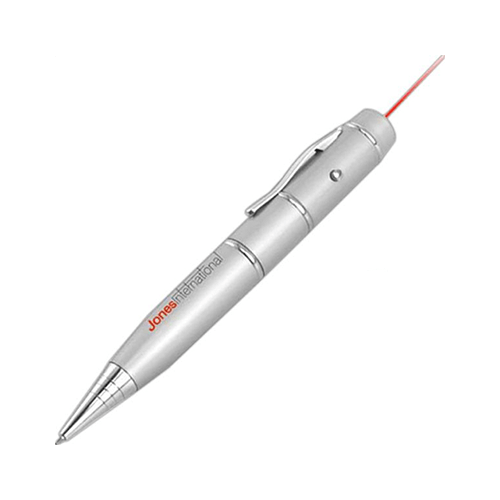 If you would like to get started on a shipment with us today, order online here and you can get started on designing your custom Laser Pen flash drives.